Like Buying Money...: Tractor Boys to keep on Rolling Rolling Rolling! There's a full fixture list throughout this midweek following the lull last week for the international qualifiers & we're starting out looking at Tuesday night's games for the best bets available with a couple of Championship games & an overpriced home team in the Champions League. 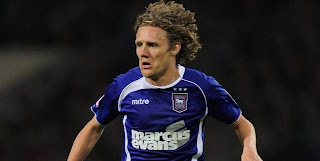 At Portman Road you have Ipswich Town up against managerless Portsmouth. The Tractor boys have endured an inconsistent start to the season with heavy defeats to Southampton & Peterborough but seem to have found form recently with three wins & two draws in their last five league matches. Their front six of Edwards, Bowyer, Andrews, Bullard, Chopra & Scotland all have Premier League experience & now seem to be gelling into a formidable attacking unit with Chopra & Andrews sharing nine league goals between them. Portsmouth loss their manager Steve Cotterill last week but managed a 2-0 victory against an average Barnsley side in the late weekend kick off. It was their third league victory of the season but all have come at Fratton Park & on their travels they have three defeats in their last three matches against Leeds, Hull & West Ham. Ipswich have the stronger line-up with plenty of attacking players in good current form & can continue their rise up the Championship table with a home victory against Portsmouth at 10/11. Further North we see Leeds United entertain Coventry City at Elland Road. Leeds easily won 3-0 against Yorkshire rivals Doncaster on Friday night with Ross McCormack scoring an excellent overhead effort. After a difficult first season where McCormack only found the net twice, he has been on fire this season with nine goals in ten league appearances. Then adding the returning Luciano Becchio into the mix, Leeds have a potent strike force which will cause plenty of problems to any Championship defence. Visitors Coventry have struggled on the road this season with four defeats against Barnsley, Ipswich, Crystal Palace & Birmingham in their five matches & have conceded nine goals. They don't score many goals either with only eight all season & just two on the road. Five of these goals have been scored by young striker Lukas Jutkiewicz & he continued his impressive record with the only goal of the game against strugglers Nottingham Forest at the weekend but the victory came at a cost after losing keeper Joe Murphy in a collision with Ishmael Miller. Leeds have won their last two matches & boast a home record of four wins from five, we can't see anything other than a comfortable home victory at a best price of 4/6. You can't ignore Ross McCormack's current form so back him to open the scoring at 4/1 & he can be backed at 11/10 to score at anytime. In the Champions League we see the Russian league runners up CSKA Moscow host the Turkish league runners up Trabzonspor in a game that can really get the Russian side's European campaign up & running. Trabzonspor lead the group thanks to a shock win away to Inter Milan in the opening week & drawing at home to Lille in week two, CSKA also managed to draw with Lille but away from home & they suffered a 3-2 defeat at home to a spirited Inter side. The Russian sides are notoriously difficult to beat at home & CSKA will have targeted this as a must win game, they've conceded 5 times in the competition so far but really have an excellent defence with Ignashevich playing with the Berezutski twins & having the outstanding goalkeeper Igor Akinfeev between the sticks. Up front for CSKA Vagner Love is always dangerous & former Manchester United player Zoran Tosic has established himself in the side offering flair & assists, Trabzonspor don't have the players to match with former Spurs player Didier Zokora in midfield plus wing back Marek Cech signed from West Brom. It loks as though the layers have overreacted based on a couple of performances & have overpriced CSKA Moscow who we would expect to be 1/2 for this, instead you can take 4/6 with Boylesports for what should be a comfortable CSKA Moscow win.